The water—vapor cycle perfectly reflects the ebb-and—flow, balance of nature and life. Join Jin on the journey of a lifetime. Flowing down the river of life — like a raindrop, on a path from lofty green mountaintops to the deep blue sea. On his journey, Jin discover what life’s about, its meaning, and what our destinies might hold. Raindrops—a roadmap to life for all ages. Raindrops is fun and unique. It examines the parallels between the human life cycle and the atmosphere’s water-vapor cycle. 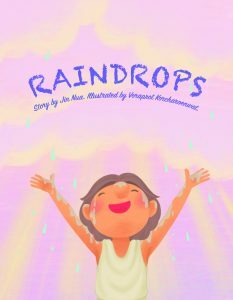 Set against the backdrop of flowing down the river of life, Raindrops examines the changes, delights, and challenges we experience as we traverse life’s wonderful journey! Buy Raindrops on Gumroad at this link for $2.99. A sampling of Raindrops an be viewed at the following the following link (Raindrops Excerpt).